Whenever I see a copy of Become Your Own Bliss, my heart skips a beat and what I see are glossy reminders of a grueling, kvelling, humbling process. One month ago today, my labor of love was finally released for public consumption. Writing has been my greatest friend, and when I finally decided to write my first book, the process felt as natural as it was uncomfortable. In all honesty, my goal was to write and publish 2 books before my 30th birthday (the clock is ticking), and the writing process that produced #BYOB was riddled with periods of free-flowing thought as well as anxiety. I've worn a lot of hats, but never had I experienced a process that was as enlightening as it was mentally and emotionally expedient. When I quit my bartending job in the spring to devote all my efforts to finishing my book and building my coaching company, I thought that I would be published by the summer. Boy, did I have a lot to learn. Self-publishing is as expensive as it's rewarding. You asked me what the process is like, so here it goes. Write manuscript 40,000 - 80,000 words, depending on your genre (novels are generally lengthier than nonfiction). Format your work - you have to know what size you want your book to be when it's printed. Remember that all even numbers are left pages and all odd numbered pages are on the right. What font do you prefer? Size preference? How many pages do you want the print copy to have? Do you want fleurons/dividers within the text? Will you be adding photos? Get your copyright page in order. Purchase ISBN and file for an LCCN prior to creating your copyright page so that you have those numbers to include. Design the book cover (or hire someone to design it for you, like I did). After the books print and arrive at your doorstep, go on a marketing blitz. More about that in another blog post. Create a blog specifically for your book. 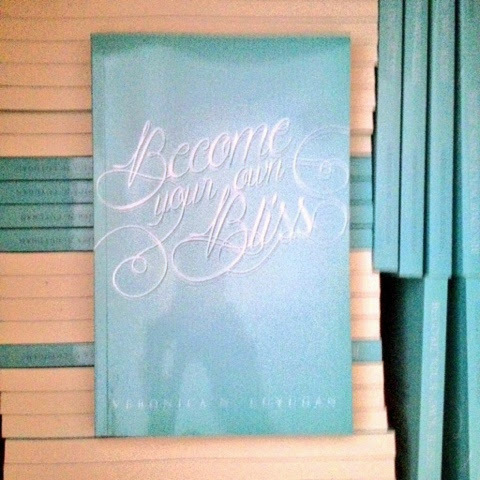 (www.becomeyourownbliss.com) This isn't only part of your marketing strategy; it's a great way to receive feedback from readers, announce book tours/speaking dates, programs that may be associated with your book, etc. Working to spread the work about your new creative baby is more than half the fun. I, personally, cringe at the thought of talking about myself, but telling people about my work brings me such great joy, and if you love what you do, I'm positive you feel the same. Like everything amazing in life, it isn't easy to write a book, but gosh, is it worth it! Not to mention the ridiculously rewarding feedback from readers. In a nutshell, it is deeply uplifting, empowering, joyful, fulfilling, and worthy of repeating. Have you had the urge to write a book? If so, what about?